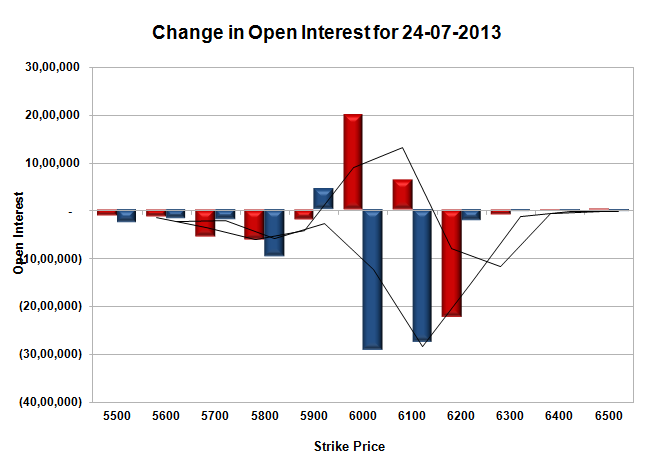 Nifty opened flat to negative but was sold-off within the first hour of trade to the lows of the day at 5676. The responsive buyer took control from thereon to cover much of the lost ground but closed just in the red at 5742, a small loss of 13.05 points. The broader market was weak, with just 401 advances to 781 declines. 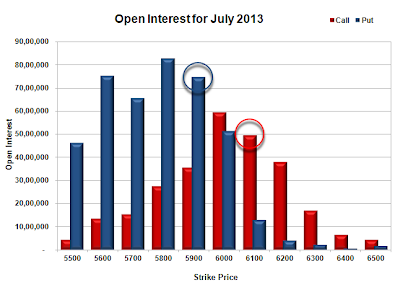 OI Table support got better at 5700 level. Call option 5600-5800, 6000-6100 added 18.11 lacs huge amount OI with profit booking seen at 6200 and above strike prices. Put option 5700-5600, 5400 added 18.32 lacs huge amount of OI with short covering seen at 5800 and above strike prices. Highest accumulation on Call option 6000 at 59.14 lacs & 6100 at 40.53 lacs whereas Put option 5700 at 59.38 lacs & 5600 at 40.78 lacs. 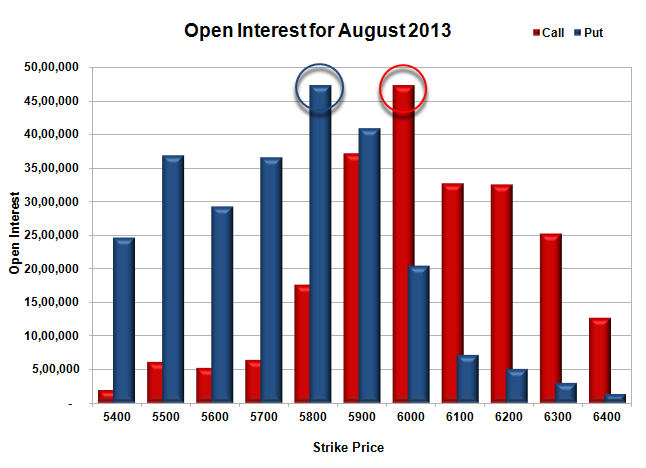 Nifty Open Interest is at 1,67,02,450 down by 6,51,650, with decrease in price, most probably huge long liquidation. Bank Nifty Open Interest is at 22,11,375, up by 51,700, with huge decrease in price, most probably huge short build-up. FII’s sold 19.93 lacs Futures, mostly long liquidation, as their net OI decreased by 5261 contracts and the average price per contract comes to around 5656.38. FII’s future open contract as on date is 400569. PCR Open Interest (Volume) has moved up to 1.083 due to huge addition at lower level PE’s. 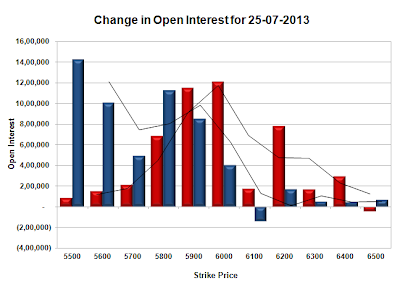 Support got better at 5700, with highest OI of 59.38 lacs and below that at 5600 with OI of 40.78 lacs. Initial resistance at 5800, with huge addition for the day at 3.13 lacs and above that at 6000 with huge OI of 59.14 lacs. 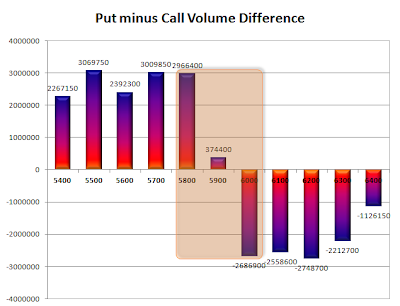 Day Range as per Option Table is 5669 - 5790 and as per VIX is 5686 - 5798 with 5723 as the Pivot. Nifty opened flat and stayed in a narrow range till RBI Governor came out with a No Change policy, which saw a small up-move which was sold off and the index moved lower with each passing hour to close near the lows at 5755.05, a huge loss of 76.60 points. This is the fifth straight day when the index closed in RED losing more than 322 points in the process. The broader market was also very weak, with just 240 advances to 947 declines. OI Table support has been pushed down to 5700 for the time being. Call option 5700-6300 added 34.37 lacs huge amount OI with profit booking seen at 6400 and above strike prices. Put option 5700-5400 added 34.52 lacs huge amount of OI with short covering seen at 5800 and above strike prices. 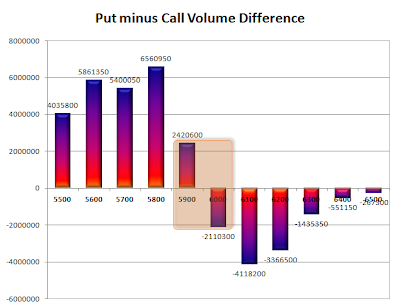 Highest accumulation on Call option 6000 at 54.88 lacs & 5900 at 43.15 lacs whereas Put option 5700 at 53.90 lacs & 5800 at 44.27 lacs. 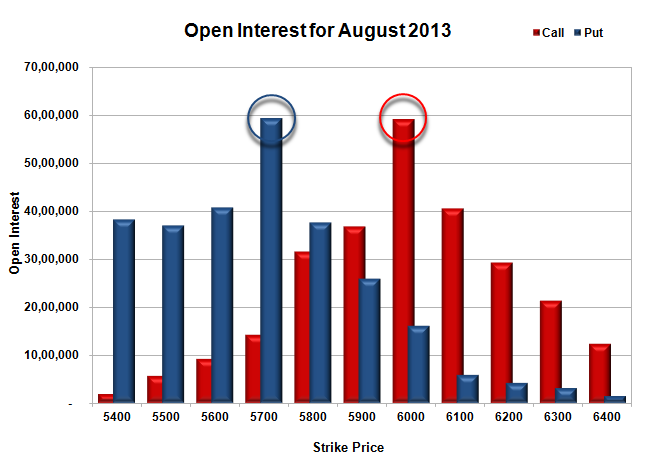 Nifty Open Interest is at 1,73,54,100 down by 7,86,900, with decrease in price, most probably huge long liquidation. 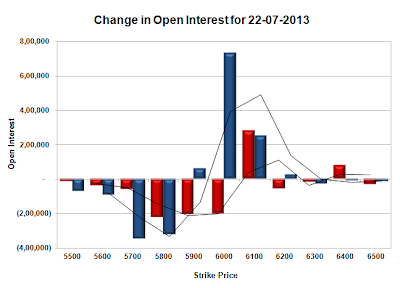 Bank Nifty Open Interest is at 21,59,675, up by 47,775, with decrease in price, most probably huge short build-up. FII’s sold 14.75 lacs Futures, mostly long liquidation, as their net OI decreased by 21814 contracts and the average price per contract comes to around 5696.54. FII’s future open contract as on date is 405830. PCR Open Interest (Volume) is dropping fast and now at 1.058. 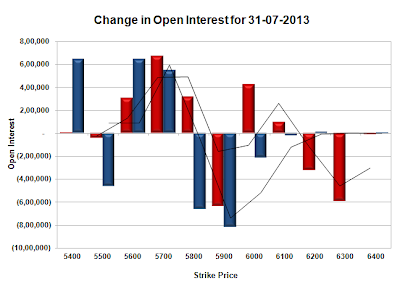 Support has shifted base at 5700, with highest OI of 53.90 lacs and below that at 5600 with OI of just 34.36 lacs. Initial resistance right now at 5800, with huge addition for the day at 10.78 lacs and above that at 5900 with huge OI of 43.15 lacs. Day Range as per Option Table is 5721 - 5841 and as per VIX is 5700 - 5810 with 5788 as the Pivot. Nifty opened just negative around 5870 level, but was sold off to the lows around 5845. A small pullback saw the sellers back in action to move the index to the lows of the day to close at 5831.65, a huge loss of 54.55 points. This is the fourth straight day when the index closed in RED losing more than 246 points in the process. The broader market was very weak, with just 344 advances to 835 declines. Resistance has started to develop around 5900 level in the Option Table. Call option 5800-6000, 6200 added 13.18 lacs huge amount OI with profit booking seen at 6100 strike price. Put option 5800-5400 added 8.38 lacs huge amount of OI with short covering seen at 6000 and above strike prices. 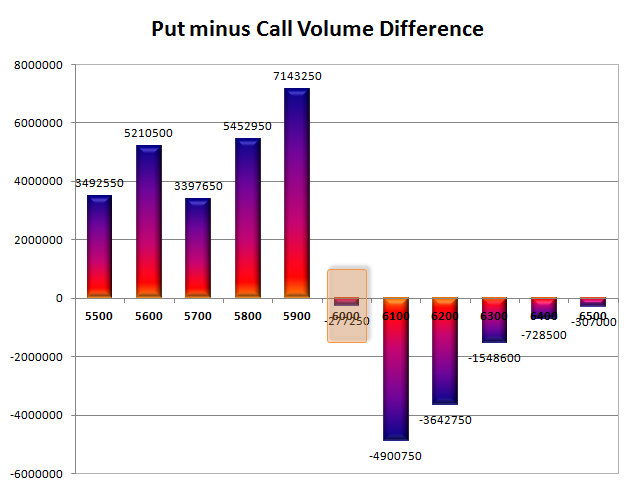 Highest accumulation on Call option 6000 at 47.36 lacs & 5900 at 37.12 lacs whereas Put option 5800 at 47.29 lacs & 5900 at 40.86 lacs. 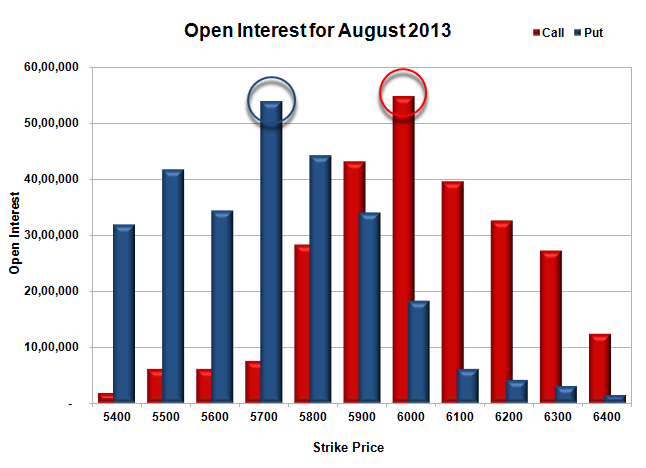 Nifty Open Interest is at 1,81,41,000 up by 1,23,950, with decrease in price, most probably short build-up. Bank Nifty Open Interest is at 21,11,900, down by 62,350, with decrease in price, most probably long liquidation. FII’s bought 0.54 lacs Futures, mostly probably short covering, as their net OI decreased by 4199 contracts and the average price per contract comes to around 5778.92. FII’s future open contract as on date is 427644. PCR Open Interest (Volume) dropped a bit more and now at 1.114. Best support at 5800, with highest OI of 47.29 lacs and below that at 5700 with OI of 36.59 lacs. Initial resistance right now at 5900, with huge addition for the day at 5.43 lacs and above that at 6000 with highest OI of 47.36 lacs. 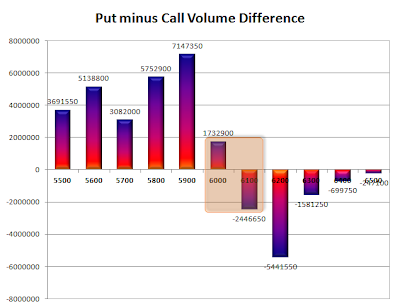 Day Range as per Option Table is 5787 - 5903 and as per VIX is 5776 - 5887 with 5848 as the Pivot. Nifty opened positive and went on to touch the highs of the day around 5945, but was sold off from there onwards moving below the psychological level of 5900. A pullback towards the end was thwarted by the bears and the index closed near the lows at 5886.20, a loss of 21.30 points. On a week on week basis the index cracked 143.00 points or about 2.37%. The broader market was very weak, with just 346 advances to 823 declines. Huge resistance is coming up around 6000 level, though it is just start of the series. Call option 5800-6300 added 31.73 lacs huge amount OI with profit booking seen at 6400 and above strike prices. Put option 5900-5500 added 24.79 lacs huge amount of OI with huge short covering seen at 6000 and above strike prices. 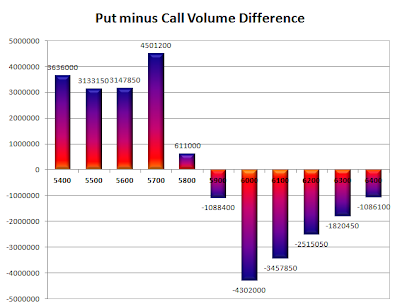 Highest accumulation on Call option 6000 at 44.19 lacs & 6100 at 35.98 lacs whereas Put option 5800 at 44.74 lacs & 5900 at 40.96 lacs. 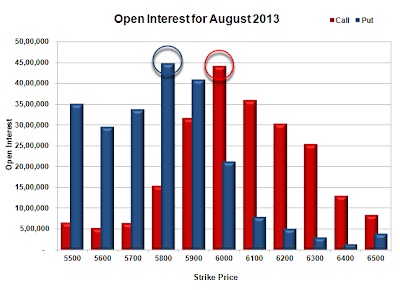 Nifty Open Interest is at 1,80,17,050 up by 9,850, with decrease in price, most probably small short build-up. Bank Nifty Open Interest is at 21,74,250, up by 3,49,975, with huge decrease in price, most probably huge short build-up. FII’s sold huge 3.63 lacs Futures, mostly probably short build-up, as their net OI increased by 3587 contracts and the average price per contract comes to around 5826.45. FII’s future open contract as on date is 431843. PCR Open Interest (Volume) just dipped a bit at 1.126. Best support developing at 5800, with highest OI of 44.74 lacs and below that at 5700 with OI of 33.81 lacs. Resistance at 6000, with OI above 44.19 lacs and above that at 6100 with OI of 35.98 lacs. Day Range as per Option Table is 5837 - 5958 and as per VIX is 5835 - 5938 with 5900 as the Pivot. Nifty opened weak on Expiry and stayed weak throughout the day to close at the lows at 5907.50, a huge loss of 83.00 points closing just above 50 Day Moving Average. The broader market was very weak, with just 363 advances to 813 declines. 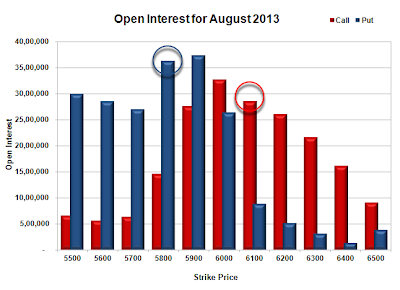 It is initial days for the OI Table but good support is building up around 5800 level. Call option 5600-6400 added 47.98 lacs huge amount OI with profit booking seen at 6500 and above strike prices. Put option 6000-5500 added 52.83 lacs huge amount of OI with huge short covering seen at 6100 level. Highest accumulation on Call option 6000 at 32.69 lacs & 6100 at 28.57 lacs whereas Put option 5900 at 37.43 lacs & 5800 at 36.34 lacs. Nifty Open Interest is at 1,80,07,200 up by 32,95,900, whereas July series liquidated 34.35 lacs, with huge decrease in price, most probably 100% rollover with small short covering. Bank Nifty Open Interest is at 18,24,275, up by 2,53,475, whereas July series liquidated 2.16 lacs, with huge decrease in price, most probably 100% rollover with small short covering. FII’s bought huge 5.52 lacs Futures, mostly probably short covering, as their net OI decreased by 219456 contracts and the average price per contract comes to around 5865.89. FII’s future open contract as on date is 428256. PCR Open Interest (Volume) at start of series is at 1.138. 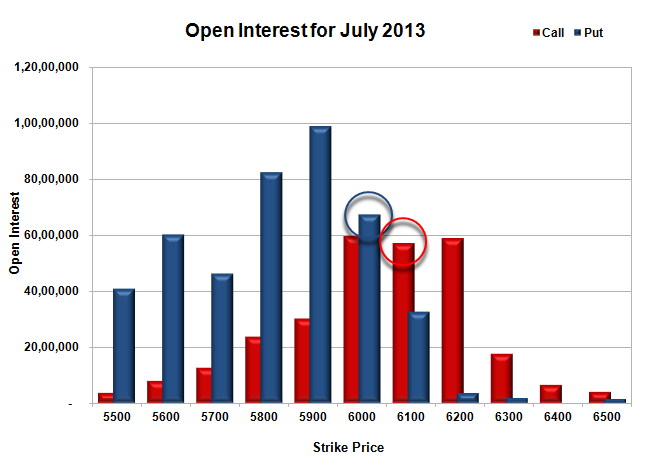 Support developing around 5900, with highest OI of 37.43 lacs and below that at 5800 with OI of 36.34 lacs. 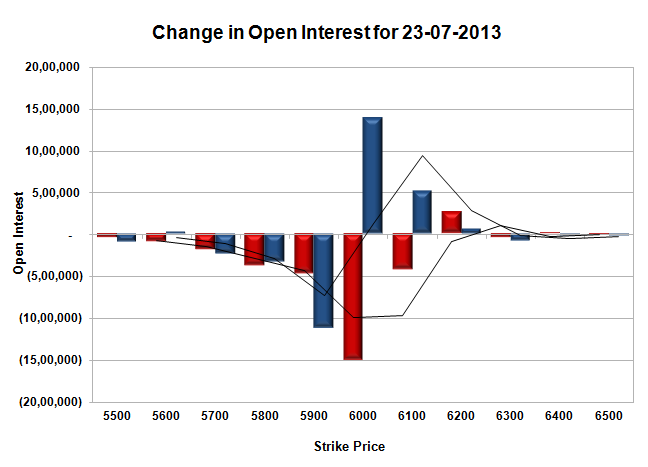 Resistance at 6000, with OI above 32.69 lacs and above that at 6100 with OI of 28.57 lacs. 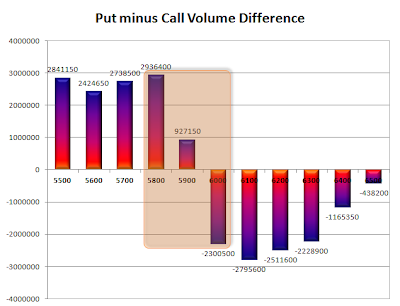 Day range as per Option Table is 5865 - 5986 and as per VIX is 5856 - 5959 with 5932 as the Pivot. Nifty opened weak due to RBI action yesterday evening of lowering the amount banks can borrow under its daily liquidity window. Bank Nifty was the biggest loser tanking 4.6% the highest in recent times. The index went on to touch the lows around 5960 but settled at 5990.50, still a huge loss of 87.30 points, closing below the psychological level of 6000. The broader market was also negative, with just 235 advances to 951 declines. 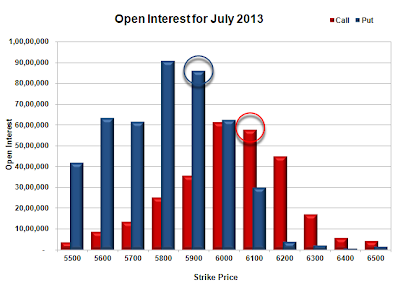 Expiry could be just below 6000 based on OI table. Call option 6000-6100 added 26.34 lacs huge amount OI with profit booking seen at 6200 and above strike prices. 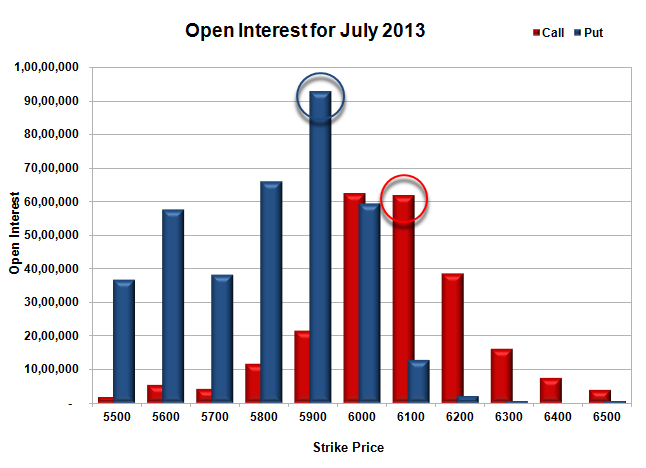 Put option 5900 added 4.53 lacs huge amount of OI with huge short covering seen at 6000 and above strike prices. Highest accumulation on Call option 6000 at 62.30 lacs & 6100 at 61.89 lacs whereas Put option 5900 at 92.93 lacs & 5800 at 66.16 lacs. Nifty Open Interest is at 93,78,800 down by 24,89,450, whereas August series added 31.71 lacs, with huge decrease in price, most probably 100% rollover with huge short build-up in next series. Bank Nifty Open Interest is at 15,96,800, down by 66,350, whereas August series added 4.18 lacs, with huge decrease in price, most probably 100% rollover with huge short build-up in next series. FII’s bought huge 7.71 lacs Futures, mostly probably long build-up, as their net OI increased by 21702 contracts and the average price per contract comes to around 5903.36. FII’s future open contract as on date is 647712. 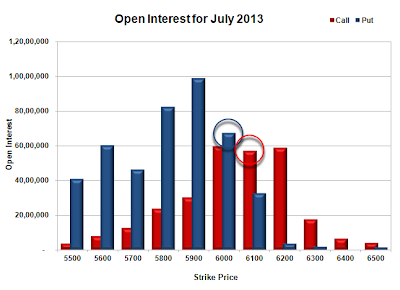 PCR Open Interest (Volume) has crashed down to 1.790. 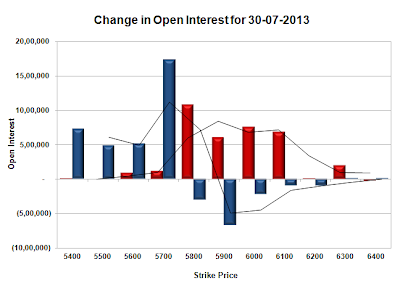 Support shifting down to 5900, with highest OI of 92.93 lacs and below that at 5800 with OI of 66.16 lacs. Initial Resistance at 6000, with OI above 62.30 lacs and above that at 6100 with OI of 61.89 lacs. 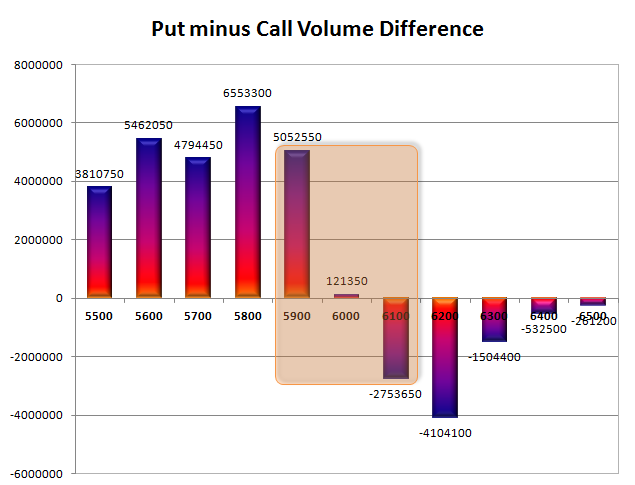 Expiry Range as per Option Table is 5938 - 6057 and as per VIX is 5937 - 6044 with 6000 as the Pivot. Nifty opened positive above the crucial resistance zone of 6060 and stayed in a narrow range of 32 points for the entire session of trade. The index after making a high of 6093 and a low of 6061 ultimately closed at 6077.80, a huge gain of 46.00 points. The broader market was just positive, with just 593 advances to 566 declines. OI table support is now at 6000 level. 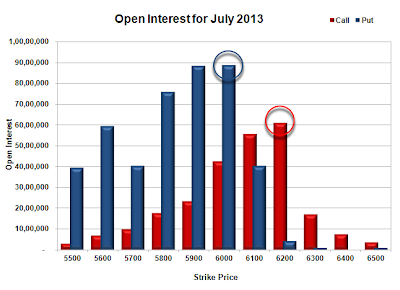 Call option 6200 added 2.73 lacs huge amount OI with short covering seen at 6100 and below strike prices. Put option 6200-6000 added 19.67 lacs huge amount of OI with profit booking seen at 5900 and below strike prices. 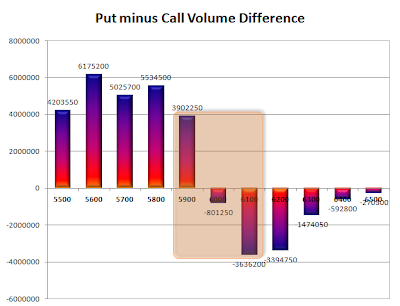 Highest accumulation on Call option 6200 at 60.98 lacs & 6100 at 55.48 lacs whereas Put option 6000 at 88.64 lacs & 5900 at 88.40 lacs. Nifty Open Interest is at 1,18,68,250 down by 22,42,050, whereas August series added 42.12 lacs, with huge increase in price, most probably 100% rollover with huge long addition in next series. Bank Nifty Open Interest is at 16,63,150, down by 1,60,075, whereas August series added 5.85 lacs, with increase in price, most probably 100% rollover with huge long build-up in next series. FII’s bought huge 16.90 lacs Futures, mostly probably long build-up, as their net OI increased by 69450 contracts and the average price per contract comes to around 6022.07. FII’s future open contract as on date is 626010. PCR Open Interest (Volume) is up at 1.958, the highest of the series and one of the highest in recent times. Super Support now at 6000, with highest OI of 88.64 lacs and below that at 5900 with huge OI of 88.40 lacs. Resistance at 6100, but looking weak and above that at 6200 with OI of 60.98 lacs. Range as per Option Table is 6021 - 6132 and as per VIX is 6025 - 6131 with 6077 as the Pivot. Nifty opened positive and moved towards 6060 level, but was sold off towards 6030, another attempt towards the highs of the day was again sold to close near the lows at 6029.20, a small loss of 8.85 points. On a week-on-week basis the index gained 20.20 points or approx 0.34%. The broader market was also weak, with just 432 advances to 746 declines. OI table though is not looking weak at all, with 5900 now a super support. 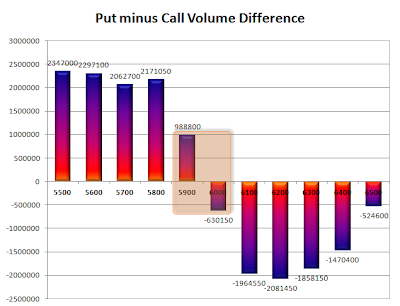 Call option 6200-6400 added 15.36 lacs huge amount OI with short covering seen at 6000 and below strike prices. Put option 6100-5900 added 20.63 lacs huge amount of OI with profit booking seen at 5800 and below strike prices. 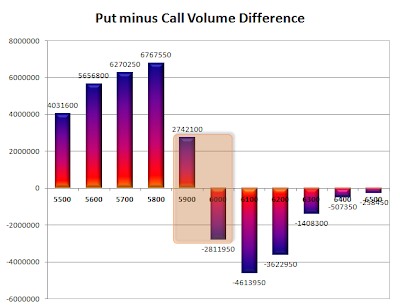 Highest accumulation on Call option 6000 at 59.40 lacs & 6200 at 58.80 lacs whereas Put option 5900 at 98.99 lacs & 5800 at 82.35 lacs. Nifty Open Interest is at 1,52,89,350 down by 9,01,500, with small decrease in price, most probably huge short covering/long liquidation. Bank Nifty Open Interest is at 17,84,700, down by 600, with decrease in price, most probably small long liquidation. FII’s bought huge 8.33 lacs Futures, mostly probably long build-up, as their net OI increased by 14397 contracts and the average price per contract comes to around 5968.43. FII’s future open contract as on date is 520970. PCR Open Interest (Volume) is still very high at 1.722. 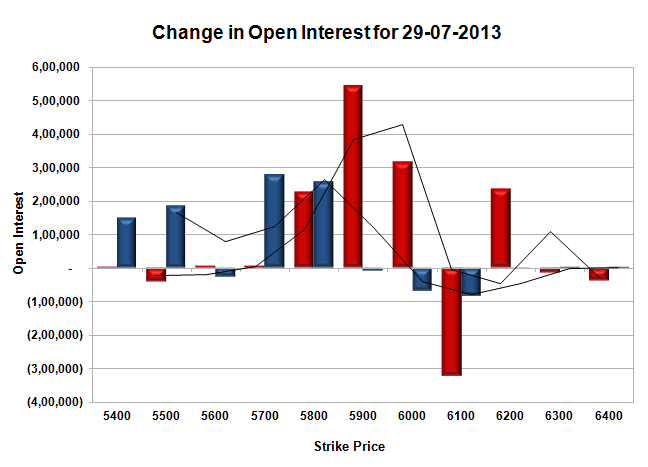 Support got better at 6000, with OI now above 67.43 lacs and below that at 5900 with highest OI of 98.99 lacs. Initial Resistance at 6100, with OI just above 56.92 lacs and above that at 6200 with OI of 58.80 lacs. Range as per Option Table is 5978 - 6094 and as per VIX is 5972 - 6086 with 6039 as the Pivot. Nifty opened positive but lazily traded within a narrow range for the entire morning session, but saw huge buying interest in the afternoon session which carried the index above 6000 to the highs of the day around 6050. The index ultimately closed at 6038.05, a huge gain of 64.75 points. The broader market was also strong, with 639 advances to 512 declines. OI table saw the breakout as discussed yesterday and the PE writers are in very strong position. 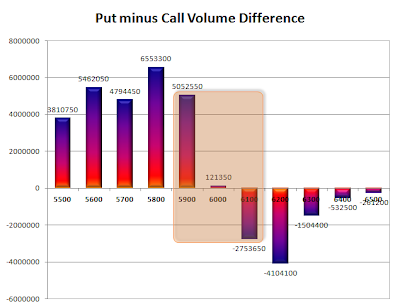 Call option 6100-6300 added 7.19 lacs huge amount OI with short covering seen at 6000 and below strike prices. Put option 6100-5900 added 53.67 lacs huge amount of OI with profit booking seen at 5800 and below strike prices. Highest accumulation on Call option 6000 at 61.19 lacs & 6100 at 57.55 lacs whereas Put option 5800 at 90.76 lacs & 5900 at 86.12 lacs. Nifty Open Interest is at 1,61,90,850 down by 2,71,850, with increase in price, most probably short covering. 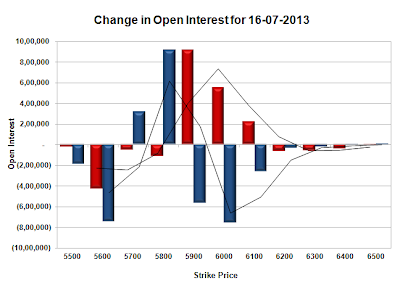 Bank Nifty Open Interest is at 17,85,300, up by 1,38,125, with increase in price, most probably huge long build-up. FII’s sold just 3500 Futures, mostly short build-up, as their net OI increased by 27232 contracts and the average price per contract comes to around 5995.39. 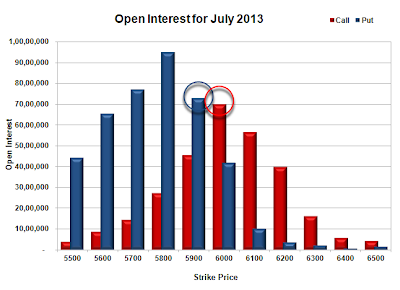 FII’s future open contract as on date is 506573. 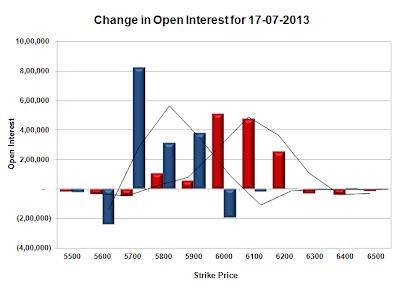 PCR Open Interest (Volume) is at the highest point of the series at 1.774. Support gathering steam at 6000, with OI now above 62.40 lacs and below that at 5900 with huge OI of 86.12 lacs. Only Resistance now at 6100, with OI just above 57.54 lacs. Range as per Option Table is 5963 - 6087 and as per VIX is 5980 - 6096 with 6021 as the Pivot. Nifty opened positive and meandered within a narrow range of 30 points for the better part of day to see a dip towards 5927 around Europe exchange open time. The dip was promptly bought by the responsive buyers and the index closed in the green at 5973.30, a small gain of 18.05 points. The broader market though was weak, with just 457 advances to 722 declines. OI table is delicately poised at 5900-6000 range with a breakout or breakdown eminent in the next few days. Call option 5800-6200 added 13.89 lacs huge amount OI with profit booking seen at 6300 and above strike prices. Put option 5900-5700 added 15.07 lacs huge amount of OI with short covering seen at 6000 and above strike prices. 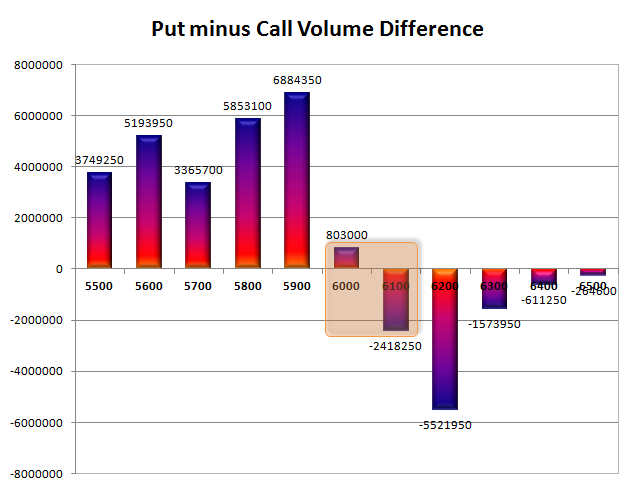 Highest accumulation on Call option 6000 at 69.99 lacs & 6100 at 56.37 lacs whereas Put option 5800 at 95.02 lacs & 5700 at 77.13 lacs. 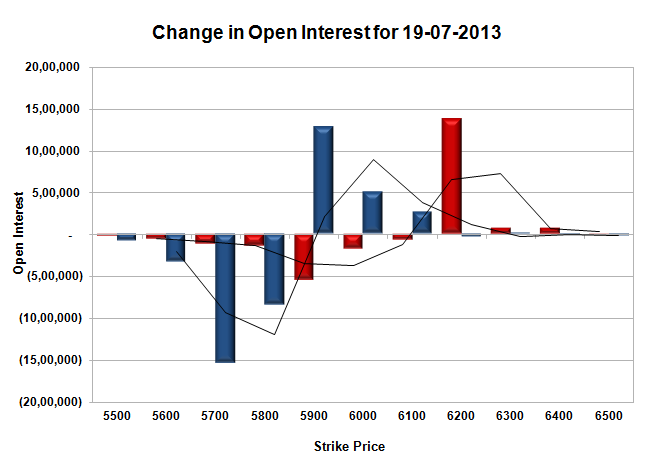 Nifty Open Interest is at 1,64,62,700 down by 1,10,200, with not much change in price, most probably long liquidation. Bank Nifty Open Interest is at 16,47,175, up by 2,62,725, with decrease in price, most probably huge short build-up. FII’s bought 3.39 lacs Futures, mostly long build-up, as their net OI increased by 14986 contracts and the average price per contract comes to around 5916.19. FII’s future open contract as on date is 479341. PCR Open Interest (Volume) is still very good at 1.600. 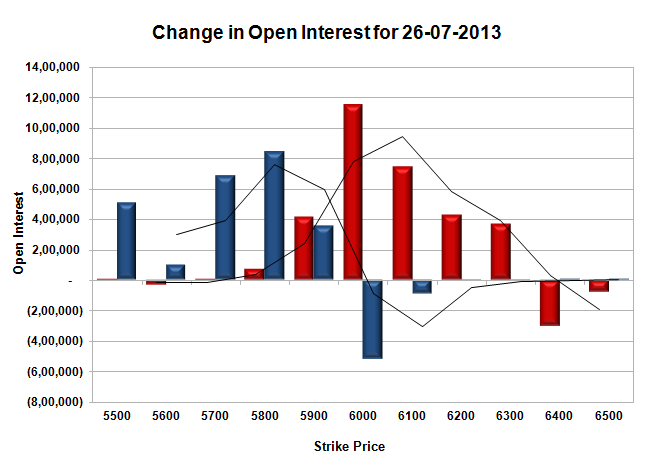 Support getting better at 5900, with OI now above 72.75 lacs and below that at 5800 with highest OI of 95.02 lacs. 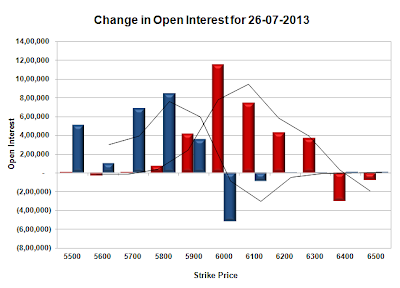 Good Resistance now at 6000, with OI just below 70 lacs and above that at 6100, with OI of 56.37 lacs. Range as per Option Table is 5904 - 6028 and as per VIX is 5913 - 6034 with 5963 as the Pivot. Nifty opened exactly 100 points down as RBI raised lending rates to commercial banks by 2 per cent to 10.25 per cent making the loans costlier. Bank Nifty was down by about 5%, but Nifty recovered some lost ground to close at 5955.25, still a huge loss 75.55 points. The broader market was also very negative, with just 341 advances to 825 declines. OI table saw huge resistance building up around 6000 level. Call option 5900-6100 added 16.90 lacs huge amount OI with profit booking seen at 6200 and above strike prices. Put option 5800-5700 added 12.36 lacs huge amount of OI with short covering seen at 5900 and above strike prices. 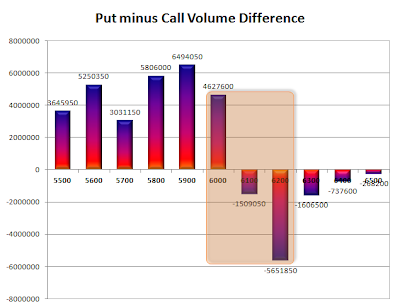 Highest accumulation on Call option 6000 at 64.95 lacs & 6100 at 51.64 lacs whereas Put option 5800 at 91.92 lacs & 5900 at 69.00 lacs. Nifty Open Interest is at 1,65,72,900 down by 14,12,750, with decrease in price, most probably huge long liquidation. 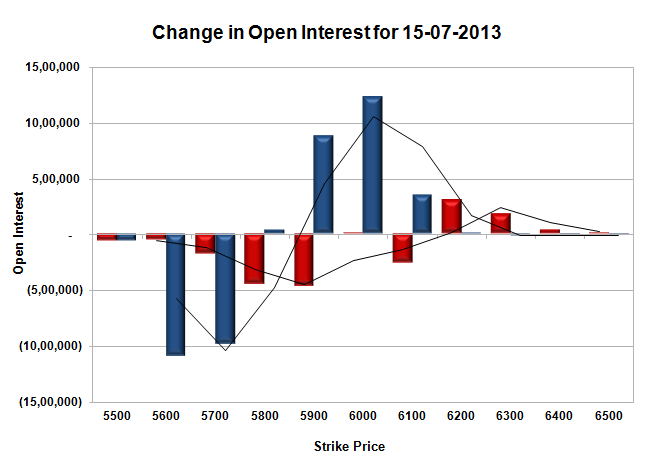 Bank Nifty Open Interest is at 13,84,450, down by 7,350, with decrease in price, most probably long liquidation. FII’s sold 4.64 lacs Futures, mostly long liquidation, as their net OI decreased by 5265 contracts and the average price per contract comes to around 5934.26. FII’s future open contract as on date is 464355. 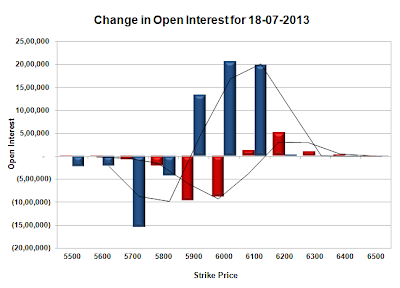 PCR Open Interest (Volume) has gone down a bit to 1.640. 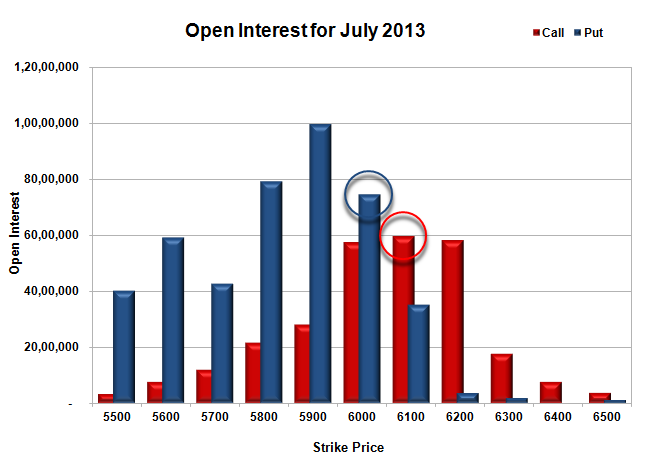 Support still very much at 5900, with huge OI of 69.00 lacs and below that at 5800 with highest OI of 91.92 lacs. Resistance building up at 6000, with OI now above 64.94 lacs and above that at 6100, with OI of 51.64 lacs. 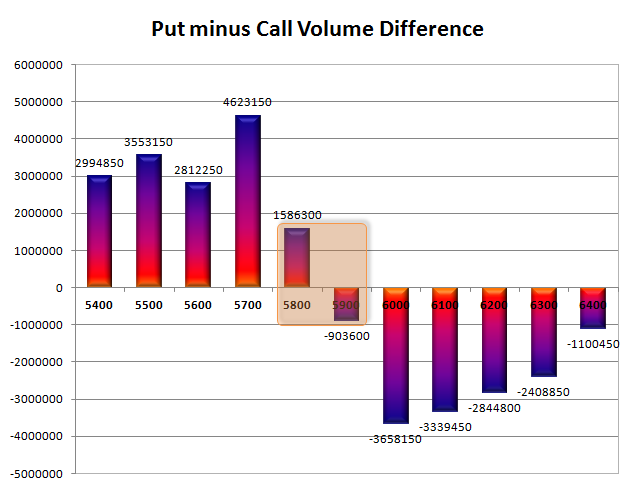 Range as per Option Table is 5882 - 6012 and as per VIX is 5896 - 6014 with 5944 as the Pivot. Nifty opened weak just below the previous day’s close and went down to touch the lows of the day around 5980. The buyer we looking for the opportunity, and grabbed it with both hands to move the index back above 6000 and towards the highs of the day around 6040. Nifty ultimately closed around the highs at 6030.80, a gain of 21.80 points. The broader market was also positive, with 720 advances to 459 declines. OI table is in full control of the Bulls with 5900 level now looking like a very good support. 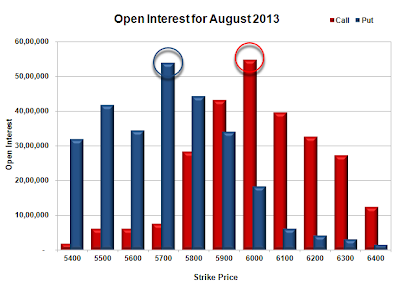 Call option 6200-6400 added 5.35 lacs OI with huge short covering seen at 6100 and below strike prices. Put option 6100-5800 added 25.07 lacs huge amount of OI with profit booking seen at 5700 and below strike prices. Highest accumulation on Call option 6000 at 59.41 lacs & 6100 at 49.43 lacs whereas Put option 5800 at 82.76 lacs & 5900 at 74.66 lacs. Nifty Open Interest is at 1,79,85,650 up by 3,23,600, with increase in price, most probably huge long build-up. 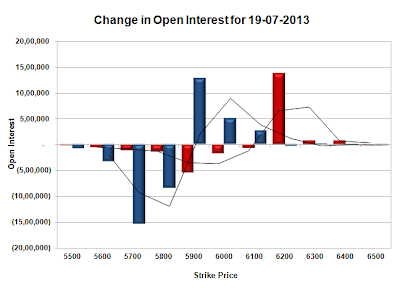 Bank Nifty Open Interest is at 13,91,800, up by 49,250, with increase in price, most probably huge long build-up. FII’s sold 3.59 lacs Futures, mostly short build-up, as their net OI increased by 23021 contracts and the average price per contract comes to around 6023.95. FII’s future open contract as on date is 469620. PCR Open Interest (Volume) is still moving higher and now at 1.754, the highest of the series. Super support now placed at 5900, with huge OI of 74.66 lacs and below that at 5800 with highest OI of 82.76 lacs. Small resistance only at 6100, with OI of just 49.43 lacs. Range as per Option Table is 5957 - 6082 and as per VIX is 5971 - 6090 with 6017 as the Pivot.